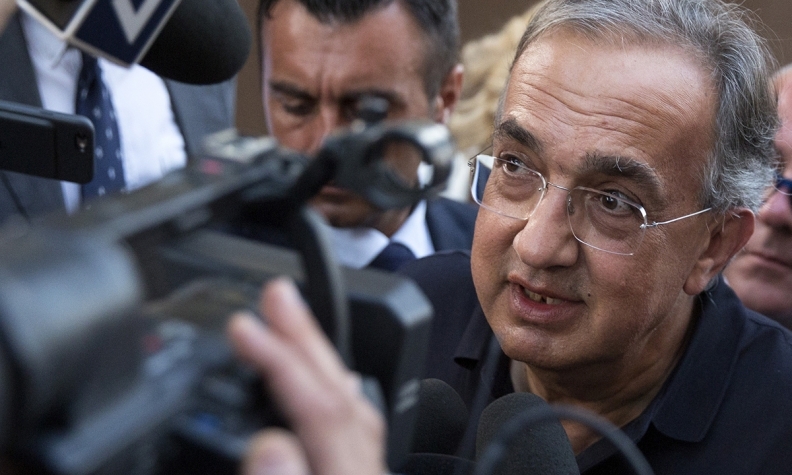 FCA CEO Sergio Marchionne will deliver his five-year plan for the company on Friday. MILAN -- Sergio Marchionne's last hurrah as CEO of Fiat Chrysler Automobiles entails betting the carmaker's future on Jeeps and Maserati luxury cars while downsizing its namesake brands, according to people familiar with the matter. Under the plan, the company is considering ending sales of Fiat cars in North America and China in the coming years, while mostly confining Chrysler to the U.S., said the people, who asked not to be identified before Marchionne unveils the strategy on Friday at the Balocco test track outside Turin. FCA declined to comment ahead of the presentation. The closely watched briefing will be something of a victory lap for the 65-year-old CEO, who is set to retire next year, taking place at the site where he laid out his survival strategy for Fiat in 2004. The presentation "will be the last major event for Sergio Marchionne as CEO and a potential catalyst for a rerating" of the stock, Giulio Pescatore, an analyst with HSBC in London, said in a note to clients. Marchionne's successor will be appointed by FCA's general meeting in April 2019. Expansion will be underpinned by rolling out brawny Jeep and Ram vehicles globally. The carmaker is also considering combining Alfa Romeo and Maserati into a single division in FCA's financial reports, the people said. Combining the upscale Italian brands would be seen by investors as a first step to an eventual spinoff. The presentation represents an important signal for the post-Marchionne era and comes on the executive's 14th anniversary at the helm after leading the carmaker back from the brink of bankruptcy and boosting the group's value more than 10 times. After the CEO steps down in 2019, Fiat's controlling shareholders are expected to evaluate long-term strategic options, including a potential merger with a larger rival. Marchionne's final plan focuses FCA's resources on promising niches rather than competing head-to-head with auto giants such as Volkswagen AG and Toyota Motor Corp. in the mass-market car business. Amid a looming transition in the way vehicles are powered, driven and sold, Marchionne has voiced concerns about the risks of mainstream autos becoming "commoditized." Prioritizing a few sharply defined brands could also make the Italian-American automaker more digestible in the event of a deal. Jeep -- which accounts for more than 70 percent of profits, according to analysts' estimates -- will increasingly become the focal point of the group. Marchionne is set to target doubling the brand's sales volume by 2022 from about 1.4 million vehicles last year. The growth is based on expanding Jeep's presence in Asia, Brazil and Europe as well as widening its product offering with hybrid variants starting next year. Marchionne has already indicated that he sees chances to double the group's profit in the coming five years on booming Jeep sales. As part of the strategy, which will include details on a new dividend policy, the carmaker will likely announce its intention to set up its own captive finance unit in the U.S., following similar structures of its American competitors, the people said. The plan could attract criticism in Italy, just as the carmaker's historical home suffers through a new round of political turmoil. After moving its headquarters outside Italy, the company is ready to abandon making mass-market cars in the country, people familiar with the matter said earlier this month, retooling Western European factories for premium cars with a global appeal, they said. As a consequence, the Fiat brand is set to be reduced to the 500 and Panda families, with sales limited to Europe, Brazil and some emerging markets. That could mean a withdrawal from the U.S., where it sought to make inroads on the heels of the Chrysler merger. The timing of that process may be complicated by dealer contracts. In China, local Fiat models failed to gain traction and are set to be halted, the people said. Italian unions have voiced concern about the lack of new models, including a decision to ditch production of no-frills cars in the country. The hard-line Fiom Cgil union will host a "workers day" in downtown Turin on Thursday, a day before the investors meeting. "The pledge for full employment in Italy is again not respected this year," said Federico Bellono, the union's Turin chief. "We are not convinced that this will happen just by building premium cars in Italy as volumes are lower." Along with shrewd dealmaking and spinoffs, Fiat's shift to crossovers from cars in the U.S. has paid off. The company reported wider profit margins than Ford Motor Co. in the first quarter, and Marchionne has set his sights on surpassing General Motors Co. in profitability before he steps down next year. A successor has yet to be named, but Marchionne has said it will be an internal candidate. CFO Richard Palmer, Europe head Alfredo Altavilla and Jeep chief Mike Manley are seen as the leading candidates. Marchionne will likely take the stage for his final act with unprecedented ceremony: wearing a tie. The iconoclastic executive has vowed to don neckwear if he's ready to declare victory in his bid to rid Fiat Chrysler of net industrial debt. The goal is key to showing that the carmaker he pulled back from the brink is ready to weather the next crisis. Chairman John Elkann, the head of the Agnelli family that controls the company, has the tie waiting in his drawer.